To review, Irvin Ellison was my 3rd great grand uncle on my maternal line. He was the brother of my 3rd great grandmother Caroline Ellison Bryant. He served in Co. H of the 36th regiment of the U. S. Colored Troops during the Civil War. 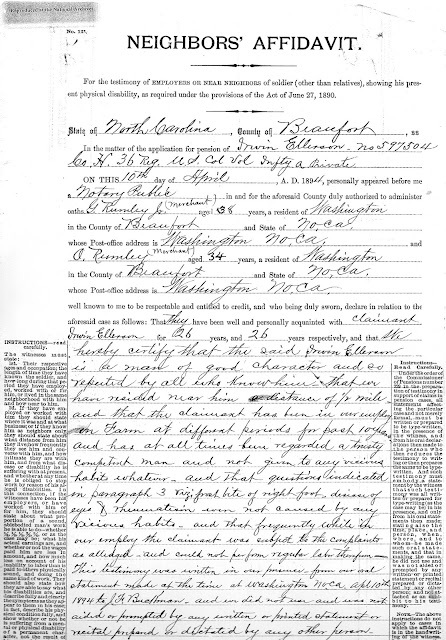 This post's focus is a neighbor's affidavit dated April 10, 1894. For the testimony of EMPLOYERS or NEAR NEIGHBORS of soldier (other than relatives), showing his present physical disability, as required under the provisions of the Act of June 27, 1890. In the matter of the application for pension of Irvin Ellison No. 597504 Co. H 36 Reg. U.S. Col Vol Infty a Private. 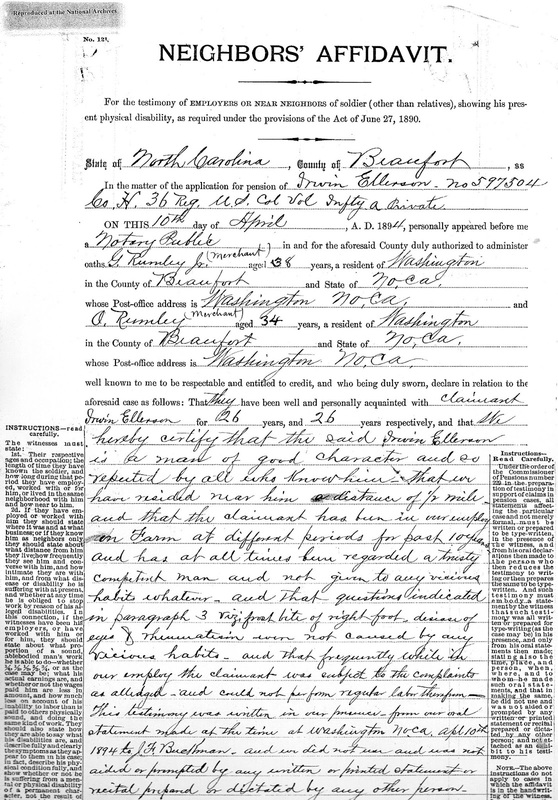 ON THIS 10th day of April , A.D. 1894, personally appeared before me a Notary Public in and for aforesaid County duly authorized to administer oaths G Rumley Jr.(merchant) aged 38 years, a resident of Washington in the County of Beaufort and State of No. Ca. whose Post-office address is Washington No. Ca. we further declare that we have no interest in said case and are not concerned in its prosecution. Note--The witnesses if not themselves equal to the task of drawing the affidavits, should go to some Notary Public, Justice of the Peace, or other officer or competent person, and have the blank filled out and properly executed. _____________added, and acquainted them with its contents before they executed the same. I further certify that I am in nowise interested in said case, nor am I concerned in its prosecution; and that said affiants are personally known to me, and that they are credible persons. 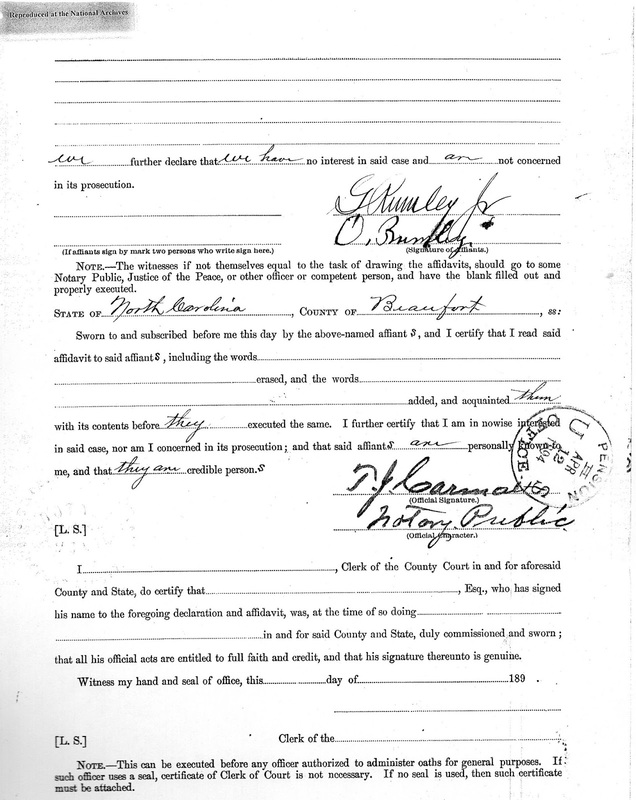 I ________________, Clerk of the County Court in and for aforesaid County and State, do certify that __________, Esq., who has signed his name to the foregoing declaration and affidavit, was, at the time so doing_____________ in and for said County and State, duly commissioned and sworn; that all his official acts are entitled to full faith and credit, and that his signature thereunto is genuine. Witness my hand and seal of office, this _______day of _______189 . Note. --This can be executed before any officer authorized to administer oaths for general purposes. If such officer uses a seal, certificate of Clerk of Court is not necessary. If no seal is used, then such certificate must be attached. You might be asking, why did I feel it was so important to highlight this affidavit? Well, the reason is this. It turns out that G. Rumley Jr. and O. Rumley were important people in the city of Washington, NC in 1894. We'll learn more about them in my next post.